Drosselmeyer puts the life sized dolls away much the children’s dismay, but they soon cheer up when their godfather hands them their gifts. Fritz’s is given a toy train while Clara is delighted with her wooden nutcracker doll. Pictured: Holly Madison performs n Nevada Ballet Theatre's The Nutcracker in Las Vegas, 2011. Worried about her broken toy, Clara sneaks down to the living room to check on the Nutcracker. She falls asleep with him in her arms under the Christmas tree. Pictured:Begona Cao and Vadim Muntagirov of the English National Ballet perform The Nutcracker at the Coliseum, London, 2011, . The pair continue on to the Land of the Sweets, where the nutcracker-turned-prince reigns from the Marzipan Castle. They are greeted by the Sugar Plum Fairy and the pair fill her in on last night’s dramatic events. Pictured: Viengsay Valdes and Elier Bouza of Cuba's National Ballet, from Canadian Ballet Youth Ensemble in Havana, 2010. Impressed by their heroism, the Sugar Plum Fairy invites them into the Candy Castle where they are treated to entertaining dance performances including The Arabian Dance and the Russian Dance. The Sugar Plum Fairy, who has already performed a solo turn, dances a pas de deux with the handsome Cavalier. After a final waltz Clara and the Prince are crowned rulers of the Land of the Sweets. Pictured: Alexandra Ansanelli as the Sugar Plum Fairy and Valeri Hristov perform during a dress rehearsal for The Nutcracker ballet at the Royal Opera House, London, 2007. The final scene finds Clara waking up under the (now normal sized) Christmas Tree with the Nutcracker doll in her arms realising it was all a dream… Pictured: Dancers from the Royal Ballet perform the Arabian Dance at the Royal Opera House, London, 2005. As with many of the great ballets, there have been, and continue to be, different interpretations of The Nutcracker. Matthew Bourne turned his magic to the much-loved ballet and his bright and brilliant interruption was an instant hit. Bourne’s reinvention moves the story from the Stahlbaum’s grand house to Dr Dross’ orphanage where Clara is whisked away from her bleak and lonely life to Sweetie land. Pictured: Dancers perform Matthew Bourne's Nutcracker at Sadlers Wells, London, 2007. Sweetieland is a neon lit, raucous and randy place with “Sugar” (Bourne’s reimagining of the Sugar Plum Fairy) seeking to spoil Clara’s happiness by stealing her prince. Hapless pyjama-clad cupids attempt to bring her and the Prince together while her friends in the orphanage are transformed into Marshmallow girls, the goby Gobstopper boys, the Liquorice Allsorts trio and Knickerbocker Glory.Pictured: Dancers perform Matthew Bourne's Nutcracker at Sadlers Wells, London, 2007. The Nutcracker Suite is based on E.T.A. Hoffmann‘s book: "The Nutcracker and the Mouse King”. 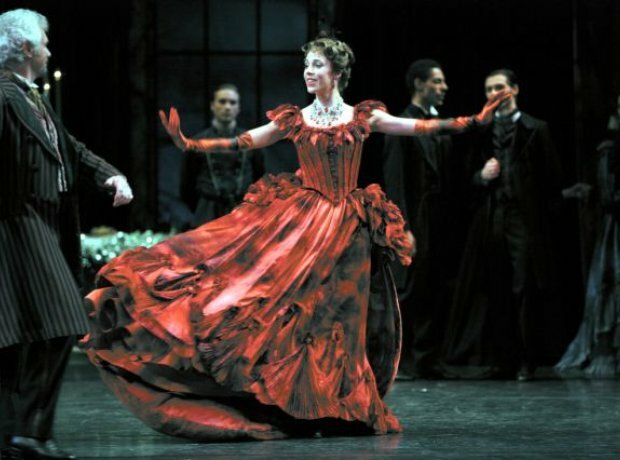 Hoffmann’s original story was darker than the ballet, but the plot remains largely the same. Written in the early 1890s, this was the last ballet score Tchaikovsky wrote – he died less than a year after it was premiered. Pictured: Jenna Roberts as the Snow Fairy with Artists of Birmingham Royal Ballet. Photo by Roy Smiljanic. Sadly Tchaikovsky died believing The Nutcracker was a flop. The ballet was largely panned by critics and audiences alike after its world premiere in St Petersburg in 1892. Unlike in most modern performances, the children’s parts, including that of Clara were danced by students at the Imperial Ballet School of St. Petersburg, but it was the adult dancers that received the most criticism. Pictured: Russian State Ballet, 2010. Tchaikovsky was commissioned to write the ballet as a double bill by Ivan Vsevolozhsky, the director of the Imperial Theatres on the back of the success of Sleeping Beauty. Tchaikovsky once again worked closely with Marius Petipa, who frustrated the composer with his detailed instructions and restrictions on the score. Pictured:Birmingham Royal Ballet's Lei Zhao as Clara with Christopher Larsen and Kit Holder in the Chinese Dance, 2011. The Nutcracker is now arguably the most popular ballet in the world, although it almost didn't cross Russian borders: he Vic-Wells Ballet's (later the Royal Ballet) first performance in 1934 was based on choreographic notations that had been smuggled out of Russia. Pictured: Scottish Ballet in Ashley Page’s The Nutcracker, 2009. Photograph by Bill Cooper.